If you want more detail, you can read our full SONIC Chic Deluxe review further down the page. Yes. The clean is weak, ineffective and unsatisfying. Sadly, of all the brushes I have tested, this provided the worst brushing and cleaning experience to date. It has some redeeming elements to it, it really is well-designed for travellers with staggering battery life, but when the job of the brush is to clean the teeth, is the compact size really worth the compromise in how well it cleans?! SONIC Chic is geared around travel, with a compact design. There are few that match up, a manual toothbrush excluded. However, Oral-B’s Pro 2 2500 and Colgate’s ProClinical Pocket-Pro and worth serious consideration. Both are bulkier, but they clean the teeth better…the whole purpose of a toothbrush. If you do find yourself on the road a lot, we list some good toothbrushes for travel here. If you simply want a decent electric toothbrush that doesn’t break the bank, see our recommendations for best budget toothbrushes. 3. Where is the best place to buy the Sonic Chic? SONIC Chic are all about compact travel toothbrushes and this is without doubt one of the most compat options I have seen and used to date. Sadly it is too the worst electric toothbrush I have used for the actual job of cleaning my teeth. I would not recommend this as a toothbrush you use all the time. If you need to travel really light, or have no better option it could work for you, but you might be better off with a manual brush. At the time of writing SONIC Chic make 2 different models of electric toothbrush. It is worth noting the difference between the Urban and the Deluxe however. The Urban offers 22,000 strokes per minute whereas the Deluxe offers up to 32,000. The Urban has 1 mode/speed setting whereas the Deluxe has 2. The 2 models use different styles of brush heads. The Urban comes in 12 different colour options whereas the Deluxe comes in 2. The Urban is the cheaper of the 2, at £20 compared to the £30 of the Deluxe. From the differences you can see the Deluxe is in theory the more premium and better performing brush. It is the Deluxe that I am reviewing here. It is the Silver coloured unit you see in the hands on photos. Here are what I consider to be the good and bad things about this SONIC Chic toothbrush. Size & weight – The brush is very compact and lightweight. If you are travelling and are really short on space then this is ideal, it takes up no space at all. Battery life – A battery is built in, no worrying about having to carry spares and offers 20 weeks of use between charges. MicroUSB charging – When it needs charging a standard microUSB connection makes it super simple to connect. Cleaning – Whilst the brush is supposed to deliver up to 32,000 movements per minute, the clean feels weak. A manual brush provides a more satisfying clean. Quality – Plastic keeps the brush lightweight, but it feels a bit cheap considering the £30 price tag. Brush heads – Small and custom to SONIC Chic, availability is limited in comparison to other brands. There is no denying that this is one of the most compact electric toothbrushes I have ever used, beaten only by Quip, a US subscription based toothbrush, powered by an AAA battery. SONIC Chic have done a good job of creating a compact travel friendly design, and lightweight. The measurements and weights are included at the end of this review, but the best thing I can compare it to is the plastic tube a posh cigar may come in, it is similar in length but not quite as wide as this. The Colgate ProClinical Pocket-Pro which I mention as an alternative is similarly sized, but when inserted in the travel case it is much bulkier. When space in a bag is at an absolute premium this will slide right into the tightest of gaps. Perfect for backpackers, weekend travellers, campers and those off on a hike. Whilst travel is the key focus here, I see no reason why it could not be kept in a drawer at work, in the car, maybe a gym bag, handbag or briefcase if you desire. Available in 2 colours Silver and Rose Gold, it is the Silver colour option I am reviewing. From a distance it looks a little more premium than it is. Made from robust plastic, the brush actually feels cheaper in hand and to the touch than I would really have liked, but it feels solid, not fragile, which is more important. The Silver body colour is accented by a chrome effect plastic that sits around the power button and at the top of the brush handle. Made up of 3 key parts, you have the main brush handle, the interchangeable brush head and the travel cap. The travel cap sits over the brush head and clips into place to create a virtually seamless Silver tube. It clicks into place with a satisfying sound and is not loose and requires some force to pull it off. You need not worry about the cap coming off when in a bag. At the top of the travel cap are 6 small holes in a circular formation that allow for airflow around the brush head when the cap is fitted. This is a neat touch and helps reduce the chance of bacteria buildup on the bristles of the brush head. Pull the cap off and the brush head sits beneath, fitted to the main brush handle that contains all the electronics. The main brush handle has an oval shaped rubber power button on the front of it. An embossed power icon makes this clear to see and grippy to the touch. It provides a good level of feedback. Just below the power button sits the battery/charge LED, smaller than the power button it is oval shaped too. Both of these are framed within a chrome plastic surround on the front of the handle. Where the travel cap meets the main brush handle is another strip of chromed plastic that runs around the whole handle and includes the SONIC Chic logo on the rear. The remainder of the handle is smooth touch Silver plastic. A slight break in the body of the handle, a few centimetres up from the base marks the end cap that can be unlocked to reveal the microUSB connection that is used to charge the battery inside the handle. Twist in an anticlockwise direction to release, pull down slightly and the port will be accessible. You can use the provided USB to microUSB cable to charge it. 3 very small ridges on the rear make it clear when the cap is fitted correctly. When the battery is charged, just push the cap up and twist in a clockwise direction to seal it shut. It is a nice tight fit and a rubber seal inside should stop any water ingression. Despite being all smooth touch plastic, with the exception of the power button, it does not feel slippery in the hand and I felt I could retain a good hold and control of the brush in use. The battery built into the brush lasts for a staggering 142 days and when low illuminates the LED on the front of the brush handle a Red colour (so the manual suggests – it didn’t). Capable of delivering up to 32,000 movements per minute the motor inside should deliver a Philips Sonicare like clean. Press the power button once to turn the brush on and launch the first cleaning mode that works at 28,000 movements per minute. Press it again and it uses the full power of the motor at 32,000 movements. Press it a third time and the brush powers off. Now, here is where things get a bit disappointing. Firstly, the manual/documentation makes no mention of the 2 modes, despite the box saying so. The actual difference between 28 and 32,000 movements per seconds is virtually impossible to notice, to the point I would argue it is not even worth having. I have tested many brushes and I don’t recall such an insignificant difference in brushing mode sensation on any other brush. However, the situation gets worse. This is probably the worst electric toothbrush I have ever used from a cleaning sensation and effectiveness point of view. You can hear and feel the motor running, there is a cleaning sensation on the teeth and gums but it felt like it was doing nothing, I really did not like brushing with this toothbrush. Although I knew the motor was running, I did not feel it cleaning my teeth effectively, there was no stimulation or that sensation of clean that I have gotten with pretty much all other brushes. I felt as if I should resort to the action of brushing the teeth as if I were with a manual toothbrush, maybe that is what SONIC Chic expect, but with 32,000 movements, it should not be necessary. In fact this is the only brush I have used that I cut short the testing, as I was so disappointed. I even then cleaned my teeth again with another brush. When the primary job of a toothbrush is to clean the teeth, I really feel this is failing. Now, let me be clear, this is not a scientific test and I cannot categorically say whether it is or is not removing plaque and debris. With Sonic cleaning it should be working below the gumline too. But, the cleaning sensation and experience is terrible in comparison. And from my personal opinion I was far from satisfied. Unsure if I was being overly critical, I gave it to my partner to try, to get her reaction. She uses a Sonicare, but does not have the experience with electric toothbrushes that I do. She is not one to criticise, but she struggled to be positive. I think this is in part as a result of the brush head. It is very small. In fact I wondered myself, if it was a child’s brush head fitted at first. It is significantly smaller than a typical Sonicare brush head and although about the same height as a round Oral-B brush head, it does not have the same width and overall surface area. Where the leading brands feel like they are covering or cupping at least 1 tooth at a time, this head does not. The suggested alternatives, the Pro 2 2500 from Oral-B and the Pocket-Pro from Colgate both clean much better. The heads on this brush are interchangeable and you get 2 in the box. You have to turn the head about 45 degrees clockwise to unlock it, before you can pull it off, then reverse the process to fit a new head. No other styles of heads exist from SONIC Chic, which is a shame because the bristles on this one feel quite stiff. A softer options would be nice. Replacement heads are available in packs of 2 for about £8, or £4 each. A lesser known brand, the availability is worse and you certainly won’t get them internationally like you will the major brands. A redeeming feature then is that when the brush is powered on it launches the timer. Either of the 2 modes last for 2 minutes. After 2 minutes has passed, the brush automatically turns off. I really like this, because not only is it a clear signal that the the dentist recommended cleaning time is over, but it conserves power too and adds a touch of convenience. As the 2 minute cleaning cycle runs, at 30 second intervals, there is a pulsation of the brush head that changes the brushing sensation and the sound. This is the 30 second pacer, or quadpacer. What this is designed to do, is encourage you to brush your teeth evenly. 30 seconds spent cleaning the upper left teeth, 30 seconds on the upper right, bottom left, bottom right. The timer and pacer are 2 essential features of any good electric toothbrush. The brush should resist toothpaste and water given it is plastic and by its very nature will be exposed to such. You should be able to rinse the head and handle clean, but SONIC Chic specifically state not to get the power button wet. I understand why, but no other manufacturer I have seen have made such comments before and I feel it’s not unreasonable to want to rinse the handle off under a tap. You will just need to be aware of this and careful. Use a towel or a damp cloth to clean the brush if needs be. Aside from the documentation and charging cable in the box there are no other additions. Some peace of mind, should the brush fail is given by the 2 year warranty that is provided. Overall, it’s not the most positive experience for the SONIC Chic Deluxe. Different the alternatives are, but they clean the teeth better and this more me is most important. No noticeable difference between the 2 modes. The redeeming feature of the Sonic Chic has to be battery life. I was mighty impressed with how long this lasted for. The running time totalled 285 cleaning sessions, when used on the lower of the 2 power settings. That is an impressive 570 minutes. From a full charge you can get about 20 weeks usage until the battery is flat. However, if it does not clean all that well does the battery life really matter?! When charging the LED on the front of the brush handle slowly pusles Blue and stop pulsing once the charge is complete. It is not the strongest LED which is both good and bad. It is supposed to flash Red when the power is low. I did not see it do this When it is low you can hear the motor getting weaker..
On the rare occasions you need to charge this, you charge it via the microUSB port built into the lower third of the brush handle. A USB to microUSB cable is provided, which means you can connect this to a USB socket on a computer, laptop, compatible socket or power adapter. It is certainly a more current and convenient way to charge in comparison to a regular charging stand many brushes come with. I don’t know exactly how long it take to charge, its not listed in the manual. I did not run any tests here, I just left it on charge overnight. The recommended retail price of the SONIC Chic Deluxe is £29.99. 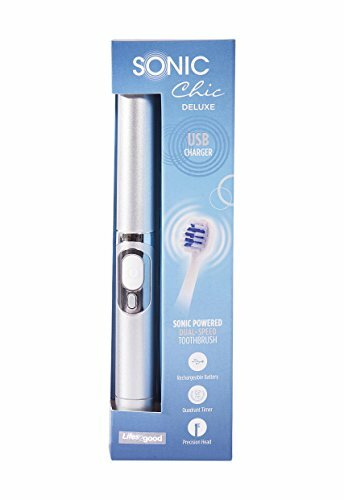 It is sold through a number of outlets, namely Amazon, Boots, Argos, Ocado, eBay and LookFantastic — we have included a live price comparison for the SONIC Chic Deluxe here. Depending on the retailer will depend on the actual selling price. At the time of review the prices varied from £23 through to the full £30 retail price, with the majority being close to the suggested sale price. Historical data does show that it has sold for less than this and can at times be purchased under £20, but there is no apparent pattern as to when the price drops this low. In some respects I do understand why the retail price is £30, I don’t think it is an unrealistic price to charge. However, with having actually purchased and used the brush I do feel when you take into consideration the alternatives, in reality, it feels more like a sub £20 product. In defence of the SONIC Chic Deluxe there is little in the way of direct competition for size and weight and it can be argued it is worth this, if space in your bag when travelling is really limited. You do to get 2 brush heads in the box, compared to the more standard 1. Like any other electric toothbrush, the heads on the brush need replacing every 3 months on average. Just like other brands, the heads for this brush as bespoke to SONIC Chic. At £8 for a pack of 2 heads, the £4 per head is certainly reasonable and well in range of comparable brands. Unlike the Sonicare, Oral-B and Colgate brands that dominate, the availability of SONIC Chic heads is limited. Thus, those gap year travellers touring the world will need to stock up on spares before leaving as it will be more difficult to source when travelling internationally. This issue is not faced with a major brand. Using the average cost (based on one user) and ownership over 3 years (the same as the warranty period), the SONIC Chic will cost £70 (£30 for the brush, plus 10 replacement heads at £4 each) or 6p per day to own. Potentially the brush will last for longer than 3 years, enabling you to get extra value from it, but my confidence for longevity is not as great as it might be with some other brands. The main alternatives I continue to compare the SONIC Chic to are the Colgate ProClinical Pocket-Pro and the Oral-B Pro 2 2500. Both are similarly priced, with the Pocket-Pro coming in at 5p per day and the 2500 at 7p. Both are bulkier, but both clean better. 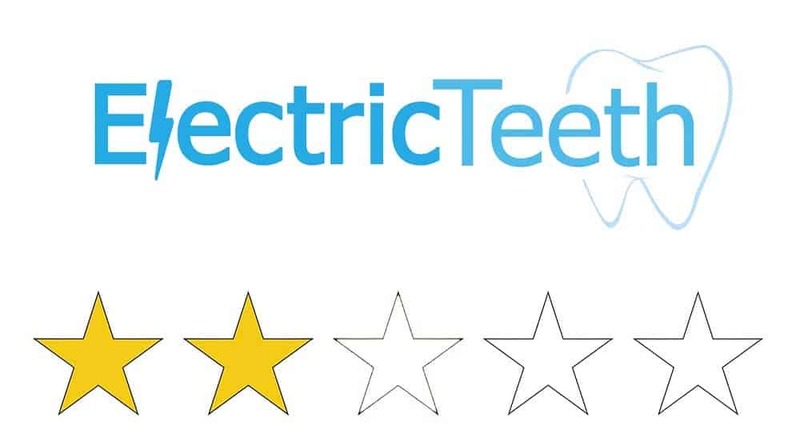 When in hand with myself and the Electric Teeth team we don’t put products through scientific stress tests, we simply use and handle the product like you would. Normally products go through several weeks of testing before review. The poor cleaning experience meant, this testing period was cut short. But the brush was still analysed the build. Our hands on experience gives us a good feel for strengths and weaknesses and on the whole things are positive for SONIC Chic. The plastic is robust and does not feel weak, the brush feels like it can withstand quite some force before it would break. The cylindrical design certainly helps here. The cap which covers the charging port would normally be an area of concern, but the fitting seems to be good, with a fairly tight seal to stop water ingression. Should something go wrong with the brush (that is not as a result of user damage) you have a 2 year warranty available from SONIC Chic, but you do need to retain your proof of purchase to make use of this. Whilst I do believe that SONIC Chic will last for a good couple of years, something about it does not leave me with the same confidence as one of the major brands and I would not expect this to last, 4 or 5 years. The ethos behind the SONIC Chic Deluxe is solid. I do feel that there is a market for such a compact, travel friendly electric toothbrush such as this. Even if not for travel per say, to keep in the car, in a drawer at work to name just a few other examples. But, when the job of the toothbrush is to clean the teeth, to me, this thing fails big time. Offering up to 32,000 movements per minute, the clean is weak and unsatisfying. I think it is summed up best by my partner. It is an ‘emergency toothbrush’. If I had to travel really light, I could use this for 1 day, maybe 2 at a push. But I would also consider just taking a manual brush, at least that way I would feel like I had cleaner teeth. Perhaps for under £20 this represents some level of value to you, but you would be better sacrificing size and going for a more capable brush, such as the Pro 2 2500 (our choice) or reverting to a manual toothbrush. Is the SONIC Chic an oscillating brush? No, it is a sonic electric toothbrush. It comes with 2 x SONIC Chic Deluxe brush heads. These are the only types of head available, there are no other choices. Does the SONIC Chic have a pressure sensor? Does the SONIC Chic have Bluetooth? Does the SONIC Chic come with a warranty & how long is it? Does the SONIC Chic have a built in timer? Yes. Often referred to as the quadpacer; subject to the cleaning mode the brush will provide an audible warning through a slight pause in the brushing mode to tell you to change quadrants. There are 4 quadrants to the mouth, and brushing is normally for 2 minutes. The timer will active at 30 second intervals and turn the brush off at the end of the 2 minutes. The battery lasts an incredible 142 days when used on the lower power setting. Yes, a microUSB to USB cable is provided. Can I use the SONIC Chic in the shower? We would advise against it. Yes, a cap that goes over the brush head is provided. The case is in part the design of the toothbrush itself. Do you own or have you used the SONIC Chic Deluxe? I love this sonic Chic Delux toothbrush. Maybe I have a smaller mouth? as it doesn’t cut into my cheek or gums. It is fantastic to travel with and for use at home. It takes no room and it is attractive. Sadly in comparison to some of the alternatives we were not very impressed. However it great to hear that you love it. We are all for people finding a brush that works best for them.